A new agriculture business has to compete hard in a market that already has many established companies. While effective marketing strategies can help grow a business, the first thing to consider when starting an agriculture venture is to name it appropriately. Unique, simple, and catchy names go a long way in building a brand in this field. Agriculture is a vast market that comprises conventional and new niches and business ideas. Your startup may also be trying to explore a recent trend in agriculture to benefit from the rising demand. While a new business idea in agriculture is most likely to yield the results and your company will grow fast. But have you brainstormed to have a valid and catchy name for your new company? Do not ignore your company name as it matters a lot in the success of the business. If your recently opened venture is not doing well, you should change your company name to leave a lasting impression on the audience. At the same time, it is true that naming a business in the modern competitive times is not easy. You have to come out with a unique but simple name that grabs the attention of potential customers. This is not an easy job as most names that you think of are already registered by some smart business owners. The first thing to ensure while naming your agriculture business is that it should be a simple and easy name. Stick to this advice if you want people to remember your company’s name. Do not forget that a newly started business desperately looks for customers in a competitive market. But an effective short name that people can pronounce easily is your first step to grab your target customers’ attention. So, avoid the names that are hard to spell. Remember also that after naming your business, you will need a logo as the face of your company. At that point, a simple and easy name will make even more impact when it appears on your unique agriculture logo design. So, whichever name you like, make sure that it is simple. Looking for an agriculture logo design? As your business grows, you would like to take it to new markets and a new set of customers. You may also want to produce and sell more agriculture products. But if the name is such that it speaks only about one product or geographical location and market, you will think of changing it later when the business grows. So, it is better to pick a name that can cover your future growth of the company. What would have happened if Amazon was named something like ‘’OnlineBooks”. The company sells a wide range of products, in fact almost everything, and not just books. Also, know that if you have to change the name later, you will be redesigning your marketing materials. For instance, you need to recreate your unique farm logo design, which you would like to avoid as customers have built some relationship with it. So, choose a name that you do not have to change later. A simple and easy name in itself is not good enough for your agriculture business. The name should have a meaning that conveys your new business idea. With such a name, you can drive customers who are looking for your type of services and products. Check if people can know what your business is all about from the name. When a business name conveys a relevant meaning, it gives your professional graphic designer some exciting design ideas to create your logos, brochures, etc. for business promotion. Your agriculture business may be fulfilling some crucial and new requirements of the target customers. The rapid technological advancement has enabled agriculture market to offer many new products and services. The sector has already niches such as snail farming and weed killer production that is meeting the demand of new age farmers. Others are — herb growing, vegetable farming, raising rabbit, and some many more niches in this sector. So, make it sure that your company name reflects your market niche. Your logo designer will also like to represent your specific field of business along with your company name in the logo. This makes the logo your striking face of the company and business. Another significant way to get some exciting naming ideas is to sit for brainstorming sessions with your company members or friends. Many creative ideas will emerge up during these sessions. One of the chief advantages of brainstorming is that you can pay attention to the pros and cons of each name suggested during the session. You should first lay some outline that defines your brand and the name you wish to have for your company. Then, ask the members to look for a name within those limitations so that everyone can concentrate on the given lines. You can also tell the team that you need a short and simple company name before you summon up graphic design services of a designer to create your visual identities like a logo, business card, and brochure. After making a short list of five to six names for your agriculture business, you should pick a name that is available as a domain address. A domain address is essential to have for launching your business on the web. Your potential customers will use their mobile devices or desktop computers to search for the type of agriculture products or services you deliver. So, check if the name is available as your .com domain name, which is a popular domain. Visit sites such as GoDaddy.com and NetworkSolutions.com to find out if the domain address for your company name is available. You can apply for other domains such as .net if the .com is not accessible. Remember that your domain address or URL will become part of your brand identity for the customers as they search your business online. Check the name for social handle USPTO.gov site to check if your business name can be registered as your trademark. If it is not available, try another name from your shortlist. So, you may have dozens of graphic design ideas for your company logo but do not implement them before securing your company name as your trademark. Besides having a domain address, you will also be looking for promoting your new agriculture business on social media. Popular social media channels like Facebook and Twitter are two of the most effective channels to spread awareness about your new company. You build a solid base of followers on different social channels whom you can turn into your customers. So, make sure that the name you intend to have for your business is also available as your social handle. You can twist the name a little to get it as your username on social media. Try to get one name as the handle on all the social channels. Therefore, get the handle before you create a remarkable social media page design to promote your new business. Since you are too close to your business naming process and you may like a name, but people may not have the same liking for it. Therefore, it is always good to have a second opinion. One of the best ways to have the correct view is to know what people have to say about the names. Get feedback from your friends, relatives, experts, and your followers on social media. These are the crucial tips you should never ignore when naming your agriculture business. The entire naming process takes time. So, have patience instead of settling for a wrong name and paying the price in the end. After you have finally chosen the right name to your business, the next logical step is to promote it. You will need dozens of promotional materials such as your brochures, website, mobile apps, business cards, stationery, and many more design solutions. You can have dozens of new design ideas for your business promotion at Designhill, a leading marketplace, at an affordable price. 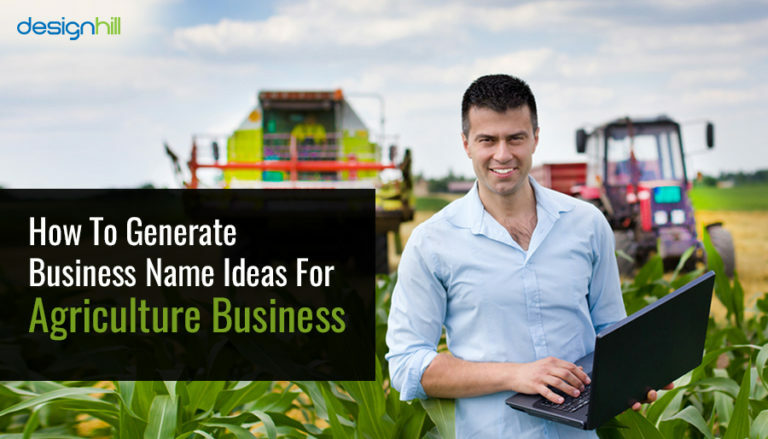 Your agriculture business needs a perfect name that is simple, easy, and unique. The name should reflect what your company does and the services or products it delivers. To get one such name, sit through several brainstorming sessions and get the name as your trademark and domain address as well.